In 2007, we listed the “freezer trick” as one of the solutions to revive a failed hard drive. Well, consider that solution as over as the last Ice Age. Freezing a hard drive is one of those home remedies that date from the early days of computing, alongside such tried-and-true methods as blowing on a game cartridge to improve its chances of being read by a Nintendo 64. The thing is, it did work. But now, storage experts say, you stand a better chance of making the problem worse. “No matter what that article might say, the freezer trick doesn’t work,” Scott Moyer, the president at DriveSavers Data Recovery, told PCWorld. Why this matters: While you may do everything right—back up files to cloud storage as well as an external hard drive, save key files on optical data, update promptly—chances are you know someone who hasn’t been as careful. Maybe they have an old PC, and they’re faced with the realization that all of their family photos could be lost. If you’re tempted to use the old trick that we all grew up with, this pro says to think twice. What is the freezer trick? At one time, a hard drive might suddenly lock up for any number of reasons, succumbing to the “click of death” or other failures. One of them could be what drive vendors called “stiction,” a fancy name for a drive whose lubrication failed. The drive’s platters essentially “stuck,” and the drive wouldn’t read data. That meant, of course, that any data stored on it was potentially lost forever. Worried you might lose your data? Here’s how to create an image backup of your entire hard drive, data and all. The “freezer trick” involved sticking the drive in a waterproof plastic bag, and then into the freezer. If you left it alone for a few hours, the cold would cool the metal down enough to constrict it, and, in some cases, free up the disks to spin. The idea behind the freezer trick was to save the data by then quickly copying it to another device before another lockup occurred, Moyer said. Stiction, though, is largely a thing of the past. 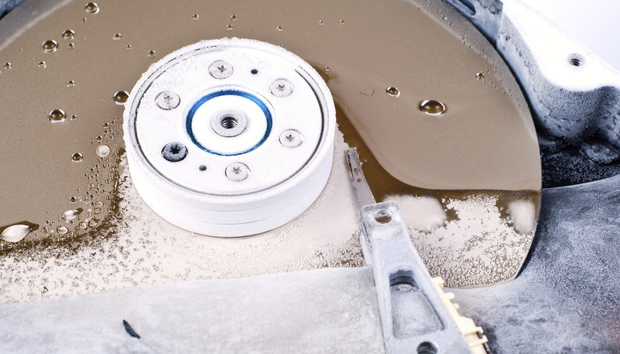 Modern and more complex drives have improved lubrication systems and “off-platter parking” (where the drive stores its head off the surface of the disk, like a phonograph, when not in use), to prevent this problem from occurring, Moyer explained. “As a result, stiction rarely happens with today’s technology,” he said. For instance, a side effect of freezing a hard drive is corrosion, caused by the transformation of water vapor inside the drive to ice crystals. Upon removal from the freezer, that ice will melt and foul the delicate electrical components inside the drive. If the drive spins up before the ice has melted, catastrophic damage will occur and data may be permanently lost. ACS Data Recovery Services provides a bit more detail: As data storage densities have grown higher and higher, the height a head flies above the spinning hard disk platter has steadily decreased. In modern drives, the clearance between a head and the disk is is slightly less than 10 nanometers—or about four times the width of a single strand of DNA. If any ice crystals form, chances are that head will crash into them. According to Moyer, today’s read errors can cascade to the firmware, then to possible electronic or PCB damage, and then on to possible errors with the drive heads themselves. Granted, a disk-drive error may be less catastrophic now that data can be backed up to cloud services like OneDrive or Google Drive, and SSDs have begun to replace hard drives inside laptops. One tool we recently discovered at CES, DriveSpar, can save you from seeking out a DriveSavers or other professional recovery service for a failing hard drive or SSD, though it will also require some investment (by either you or your local computer shop). We all have our little bags of tricks: fixes we can bring out when all else fails. But it’s important to let people know that an important one doesn’t work any more.